Why do I need a 7 day ECG? Sometimes you may experience palpitations (strong heart beats), dizziness, chest pain, shortness of breath or other symptoms. A 7 day ECG can help with the diagnosis of many conditions affecting the heart and lungs. Some symptoms may not take place during a routine heart examination, so your doctor has asked for you to be monitored over a week-long period. The 7 day ECG monitor will record electrical signals from your heart over a full week. This ECG analysis will monitor your heart rhythm during everyday life to see how your heart reacts to activity, rest and/or medication changes. You do not need to stay in hospital during the test. What is a 7 day ECG? 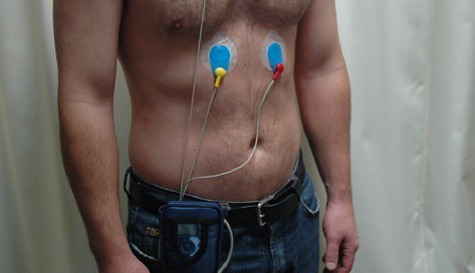 The ECG monitor is a small and lightweight computerised device for professional ECG analysis. It is used to continuously detect and record your heart rhythm over a 7 day period. This involves placing several small and sticky electrode patches onto your chest. The patches are connected with a wire to a portable recording machine which will pick up and record electrical signals produced by every heartbeat. You will not feel anything and there will be no pain or discomfort during the ECG.